Japanese culture and products attract more and more people who are living the west. However, apparently Japanese noren is a relatively new comer for most of you, compared to those Japanese home furnishings that have already become very popular today worldwide. If you are really into orient culture, you must know them well and these household names include tatami mats, platform beds, shoji room dividers, screens and so on. If you are also fond of Asian decor, especially featuring the bamboo pattern, this 33.5″X35.5″ Japanese doorway curtain #PCOS-50, offered by eKitron, is a perfect one for you. As you may know, bamboo is one of the favorite images that are depicted in Asian work of art as it often represents humility, integrity, honesty and braveness. So, the design on this curtain was given a lot of meaning. That’s to say, every detail reflect more connotation than you could thought of. 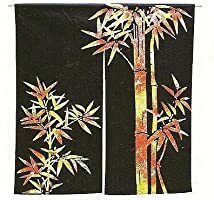 This Japanese noren curtain is no exception and has a few bamboos that are set against a black background, which thus highlight the tall and straight bamboo in a better way. On top of that, the batik-style silk screen process makes it appear more elegant with classic simplicity. As was mentioned above, Noren curtains are not a popular doorway curtain yet in the west world. However, that is the exact reason that you should choose it and hence exoticize your home decor and amaze your visitors once hanging it as a home wall decoration. As you can see, most of Westerners love to use a window or door dressing. If you have got fed up with that practice too, using the natural cotton and rayon blend canvas would be a good idea. Actually it not only provides scenic beauty but also adds a little antique Asian exotic atmosphere to your home.